Each year at the Gala DVUSA recognizes an individual or organization that embodies the DVUSA mission with the Sr. Marcella Connolly Award, named after the Sinsinawa Dominican sister who founded the Sinsinawa Dominican Apostolic Volunteer Program. DVUSA is honored to present this year’s Sr. Marcella Connolly Award to our ministry partner, Visitation Catholic School. For 128 years, Visitation Catholic School has been inviting, comforting, and proclaiming God’s goodness and love to the people of the Englewood and Back of the Yards neighborhoods. Apostolic Volunteers, and later Dominican Volunteers, have been serving at Visitation Catholic School since 1974. 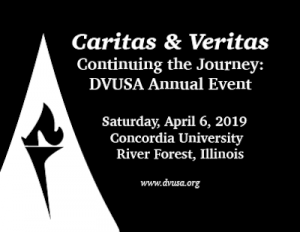 For more I formation about the 2019 DVUSA Gala and registration, please click here.